This is the time of year that all the H23’ers look forward to as the Holiday 23 Masters brought a total of 18 boats together in the racing and cruising divisions. This event surely did leave room for racing, having fun and getting to know all the owners of the H23’s. With very little wind on the first day, the yachts still managed to have a good sail, ending at VCA (Vaal Cruising Association) with a funny hat evening and braai. From VCA the following day, yachts raced to LDYC (Lake Deneysville Yacht Club) for the first leg of the race and ended at Stilbaai for the evening. Day three the yachts set sail from Stilbaai and raced off to PNYC (Pennant Nine Yacht Club) where we spent a wonderful evening socializing and relaxing after a nice day of sailing with light wind. Every evening there was a special, funny prize giving for those who made some crucial errors, or should I rather say, boo-boos! This was quite entertaining, which also put emphasis on the fun part of sailing. Before we sailed off to our last destination for the Masters, boats had to ramp up for a group photo. The challenge with this was that the weather had to play along to be able to achieve this. Luckily, the wind and the water had mercy on the boats, which made this possible. A total of 15 boats were present for this historical moment, therefor breaking the 1980’s record. Afterwards racing continued to Hector Bay where we spent the remainder of the day at Karlien’s Place – a slice of heaven. This day was packed with an eventful afternoon. Strong winds and gusts interrupted a quiet afternoon of rest before dinner. Anchors were dragging in the wind and boats collided, dragging Nakita with skipper Pierre Myburgh and his crew, to shore. He saved the day by lifting the keel and was stranded safely on the shore for the remainder of the night. 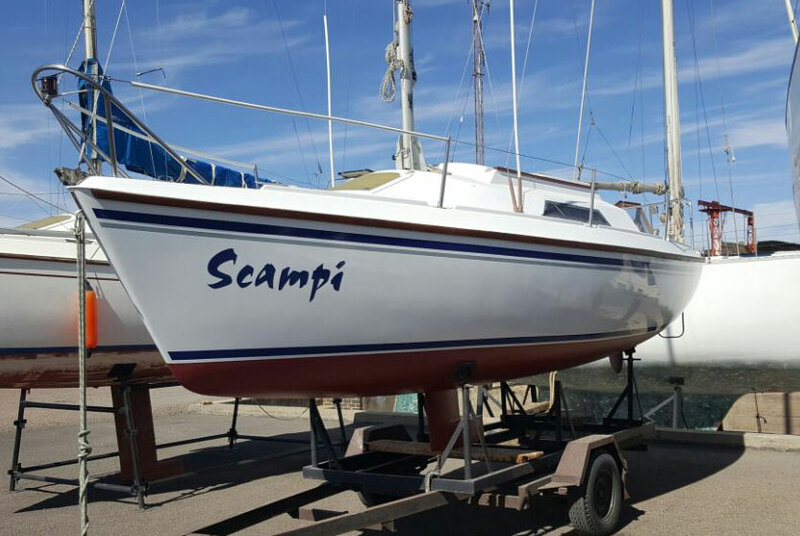 Skipper Jacques Rossouw from Scampi, along with one of his crew, Pieter Bunton, motored to the boats in danger, safely securing the boats whose crew were left stranded. Two boats decided to sail to a safe harbour in the midst of the waves to wait for the storm to pass. With the storm raging for most of the night and along with drizzles of rain, nobody on their boats could come ashore, leaving half the crew on boats, and half ashore while waiting out the storm. This was an eventful last day. The winds calmed down the next day in time for breakfast and the final prize giving ceremony. The winner of the racing division was Zani with skipper Henk Jonker and his crew Antoinette Jonker who took this honour for the second time. Without doubt they sailed almost flawlessly every day, leaving no space for errors. First in the cruising division, and also newcomers to the Holiday 23 club, was Trade Wind with skipper Mike den Drijver and crew Ryan den Drijver. They made their mark and will be returning for the next Masters. With nothing less than pure sailing pleasure and fun, this event was one to be remembered and written down in the history books of the Vaal Dam H23 club. Last updated on 07 May 2018 .